Annual Boy Scout Troop fundraiser. We will be taking over Woodbridge Senior High School this year to hold our family friendly comic con. We would love to have a Rebel Legion / Freedom Base table at the event. More details can be found on our website and Facebook pages. I am tentative for this one- if I wasn't able to march in the Scottish Walk the day before due to inclement weather, then I will be able to make it as Ackbar. 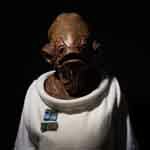 If I march as Ackbar the day before, I probably won't have time to clean/dry the costume before this event. If you need non-costumed table staff or handlers, please let me know.